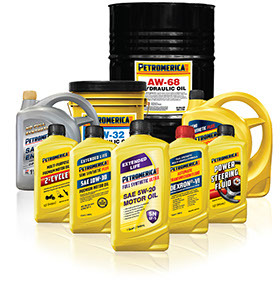 Petromerica High Performance Motor Oils are general purpose multi-grade motor oils blended from premium base stocks and advanced automotive additives to help minimizes sludge and varnish formation and provide superior anti-wear protection and deposit control even under severe driving conditions. Petromerica High Performance Motor Oils are designed to meet today’s highest industry standards and are suitable for use in passenger car, SUV, light duty truck and other mobile and stationary gasoline engines. Please contact your Petromerica sales representative at info@petromericamotoroil.com for more details. Petromerica is a superior oil brand that has successfully established itself on the US and international automotive markets. Besides we're proud that our lubricants, their price & quality are quite competitive and have been well appreciated by reputed oil experts. We manufacture general-purpose multi-grade motor oils blended from premium base stocks and advanced automotive additives for the perfect “automotive-heart "operating. Our high-quality automotive lubricants are designed for maximum engine protection even under the most difficult driving conditions. They exceed the conventional motor oils, reduce friction, prevent wear on start-up and protect the engine from sediment and corrosion. Petromerica oils are suitable for use in a passenger car, SUV, light-duty truck and other mobile and stationary gasoline engines. Brand' products are certified and conform to the American Petroleum Institute (API) standards. Take advantage of our high-performance motor oils and make sure that "price-quality" formula is rather valid for both of you!